Thank you to those families who have donated chocolate eggs and bunnies to our Easter raffle. If you haven’t made your donation yet, there is still time! The basket will be out until Monday 3rd April. The more eggs we have, the more prizes we can give away! All the money raised from the raffle goes towards Mission fundraising. Donations of baskets for the raffle are also much appreciated, please take them to the front office if you have any. A letter went home yesterday to all Year One parents outlining the roles that the children will be playing in the Year One presentation of the Stations at 9am on Monday. We have discussed with the children that we need to keep the costumes simple! 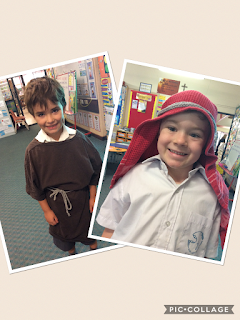 The photos below might help if your child is a disciple or an onlooker. Mrs Derickx has kindly made the soldiers and Pontius Pilate a hat which we can leave at school until Monday morning. Readers will stay in school uniform. If your child has been selected for a reading part please practise with them as much as possible before Monday! We will be doing the same at school this week. Any other questions, just ask us! Many thanks to all of the parents for attending our Parent/Teacher meetings over the past two weeks. Your input into your child’s learning is invaluable and we really appreciate all of your support and feedback.